This recipe is simply fantastic. A wonderful twist on the traditional surf and turf of lobster and steak. This is sure to wow any guest that you have over. Our special twist on this is to add cocoa powder to the short rib sauce to make it extra rich! For the short ribs: Preheat the oven to 350 degrees F.
In a large dutch oven, heat the oil over medium-high heat. Season the meat with salt and pepper and brown on all sides. remove the short ribs and set aside. Add the onion, carrot, paprika, caraway seeds, thyme, and Hershey's cocoa powder to the pan and cook until softened, about 10 minutes. Pour in the honey, red wine, and stock and bring it to a boil. Return the meat to the pan; the liquid should just about cover the meat. Place the pot in the oven and put on the lid loosely to allow the steam to escape and the sauce to thicken. Cook until the meat is very tender, 2 1/2 to 3 hours. Place the meat on a platter and keep it warm. If necessary, cook the liquid over high heat until it is thick and syrupy. Remove from the heat and return the meat to the pan while you make the scallops. For the scallops: In a saucepan over high heat, add the chicken broth, cream, orange zest, and saffron, if using. Cook until the liquid is reduced and thick, about 10 minutes. Meanwhile, pat the scallops dry with paper towels. Season them well with salt and pepper. Put a large skillet over medium-high heat and add 3 tablespoons of olive oil. Sear the scallops without moving them for 1 to 2 minutes. When nicely browned, turn them over and sear them on the other side. Remove the scallops and set aside. Pour out any excess oil and add the cream mixture tot he pan. Let this reduce over high heat for about 2 minutes. return the scallops to the pan and cook until they are heated through, about 1 minute. 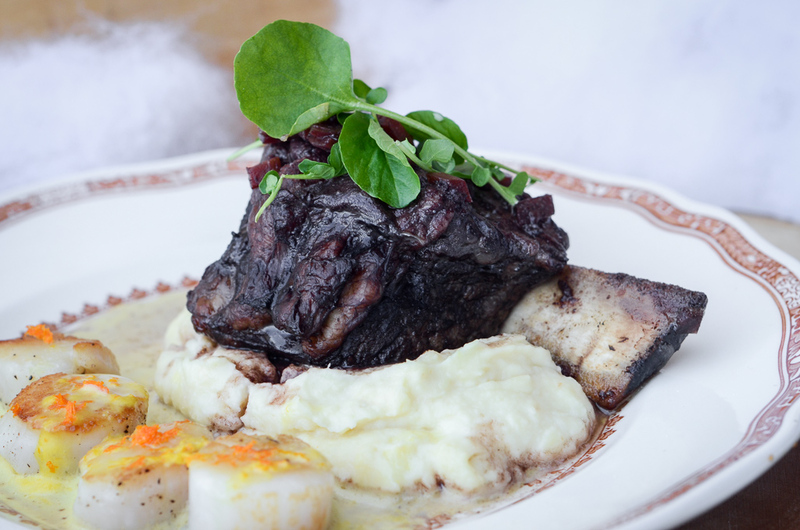 Serve the sticky short ribs topped with the creamy scallops; garnish with watercress.